Summary: Alaska, 1920: a brutal place to homestead, and especially tough for recent arrivals Jack and Mabel. Childless, they are drifting apart--he breaking under the weight of the work of the farm; she crumbling from loneliness and despair. In a moment of levity during the season's first snowfall, they build a child out of snow. The next morning the snow child is gone--but they glimpse a young, blonde-haired girl running through the trees. 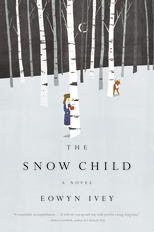 This month, my book club read THE SNOW CHILD by Eowyn Ivey. Considering that I co-host the Reagan Arthur Books Challenge with Kathy/Bermudaonion, you might think that this novel was a re-read for me. But you'd be very wrong. Despite seeing some great reviews for THE SNOW CHILD, I wasn't all that interested in the premise. It just seemed a little to "magical" for my tastes. As a result, reading the book was not a priority for me and it kind of got lost in the shuffle. So when my friend announced that we'd be reading THE SNOW CHILD for August, I was pretty happy. You see, I knew that I should read it, but I needed a little push to actually read it. Now, I am the first to admit that I shouldn't have waited so long to pick up this novel. It was a beautifully written story that definitely entertained me. THE SNOW CHILD tells the story of Jack and Mabel, a couple who picks up and moves to Alaska to run a farm after they both decide that they need a fresh start. Jack and Mabel have been dealing for years with infertility, and it's starting to catch up with them. Mabel is severely depressed and lonely, and the couple is slowly starting to drift apart. One evening, after the first snow of the season, Jack and Mabel decide to build a snow child. The next morning they wake up to find that the snow has melted, but that there is now a little girl running around their farm. At first, Jack and Mabel aren't quite sure what to make of things; however, they both accept her as real when they learn that the other one also sees her. Eventually the girl, whose name is Faina, decides that she trusts Jack and Mabel enough to enter their home and eat with them; and she even begins to visit every winter. Jack and Mabel finally experience joy in their bleak lives, and they soon begin to love Faina as if she were their very own daughter. After Faina enters the picture, so many of Jack and Mabel's problems seem to go away. For example, food mysteriously shows up on their doorstep when they are hungry and animals suddenly seem to appear when Jack is out hunting. In addition, Jack and Mabel make friends with their closest neighbors which not only helps them with their loneliness but also with getting the planting completed. However, Faina also manages to cause some upheaval with a few of her actions and eventually causes a great deal of pain to those who love her the most. Having said that, I thought THE SNOW CHILD was an extremely well written novel. I was impressed by so many things that Ms. Ivey did with this book. First of all, I loved how she incorporated the fable of The Snow Child into this story. Mabel used to read this story as a child, and she wanted to believe that Faina was her very own Snow Child. Similarly, I liked how she also juxtaposed Faina's story with The Snow Child story from Mabel's childhood. In addition, I liked how the author left so much of the story up to the reader's personal interpretation. I know I was pretty sure about a few things that took place in this story, and then I got to book club and discovered that my friends all had different thoughts. Learning this actually made me appreciate the novel even more! I did find this story to be entertaining and even thought-provoking and I always appreciate these things, but what made THE SNOW CHILD stand out to me as the actual writing. Ms. Ivey's prose was so eloquent. I adored her descriptions of Alaska and I honestly had a chill the entire time I read about the brutally cold weather. But I also could visualize the farmland, their house, and even the clothes that Mabel made for Faina. Furthermore, I was blown away by how Ms. Ivey managed to evoke so much emotion in her words. Mabel was so desperate and lonely and I could feel her pain. I absolutely loved how real Mabel was to me and I think her character might be the reason that I enjoyed this book as much as I did. I thought THE SNOW CHILD was a great selection for our book club. As I mentioned earlier, we had some very differing views, or maybe I should say interpretations, of what happened in the book. (I was definitely in the minority if that tells you anything, but I'm still not totally convinced that I'm wrong!) I loved how we discussed what happened (or could have happened) along with the magical elements of the story. There is a reading guide available, but we didn't even need to use it. Some of the topics that you need to explore include loneliness, friendship, marriage, infertility, family, love, loss, grief, and parenting. In addition, there are quite a few symbols to analyze as well as different ways to interpret Faina and her actions. Overall, THE SNOW CHILD was a gorgeous read and I recommend it to fans of magical realism, fairy tales, and literary fiction. I need to read this too. The premise you described kind of reminds me of the movie that's out now - The Odd Life of Timothy Green, or something like that. I'm glad you enjoyed this - I have a feeling I will too. It actually DID sort of remind me of the reviews of the movie that Kathy is talking about. I liked the book OK, but didn't love it. It started off feeling like magical surrealism, but then...it didn't. Is the little girl real or just a figment of Jack and Mabel's imagination, in order to cope with not having a child of their own? I had no idea what was going on or what was going to happen. It was a pleasant read, but often felt off-balance. I read this book. It doesn’t live up to the many reviews of it that I read. It is simply a retelling of a Russian fairy tale. But I would think that, in doing so, the author would have filled in the blanks, i.e., she would have made the tale seem more realistic by showing how the unrealistic might really have happened. And she does seem to be trying to do that. But the reader still needs a willing suspension of disbelief. The book is full of unanswered questions. I knew THE SNOW CHILD was based on a fairy tale. I learned that that’s not all—-it IS a fairy tale. I won this book from Freda's Voice blog. I haven't read this book, but this seems like a familiar story to me. I think most reviews of this one have been positive. I just thought the writing was so beautiful, and I loved the evolution of Jack and Mabel's relationship. I agree that it was an actual fairy tale, not just a book based on a fairy tale. Sounds like that Disney movie that is coming out with Jennifer Gardner... I would never think of picking it up but, It does sound interesting after reading your review. I read this for my book club and didn't care for it at all. It does sound like the Disney movie coming out!